The big day is coming, and of course, what you care most about is that everything is perfect, you must remember that beyond the buffet, decoration or gifts, the eye catcher of the guests, is the bride, for this reason you must be beautiful and to achieve this you need to choose the right wedding dress. Then we present some beautiful modern wedding dresses. This first model strapless, has the peculiarity of incorporating classic black color, the cut of the skirt and pleated A, is making it more beautiful and modern. Another model strapless a very slim-fitting corset and skirt cut A, the rhinestones applied both in the chest and in the skirt, it creates a fantastic effect. Beautiful dress with straps that attach the neck, diagonal pleats on the front, creating a stunning visual effect. 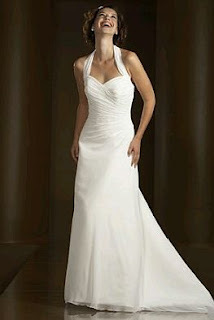 Modern and original proposal, it is a sleeveless dress that is held by the neck with a pleated skirt and beading on the chest. Strapless dress with colored embroidery on the chest and skirt, bend at the waist creates a visual effect very flattering to the figure, this dress is used with gloves and a small veil. 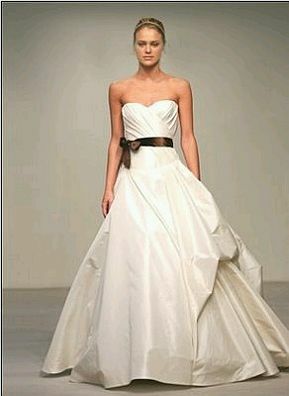 Beautiful strapless dress with a bow at the waist and brown skirt very wide and irregular. 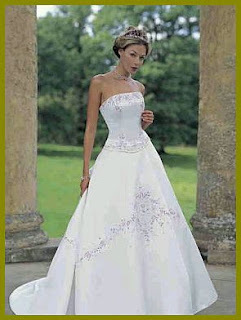 Dress very modern and delicate strapless, corset on top form allows much better the figure, while the skirt highlight the applications of flowers. Another beautiful model strapless wedding dress with a pleated detail on the chest that is repeated on the hips, the skirt is quite original because the fabric material simulates the use of feathers. 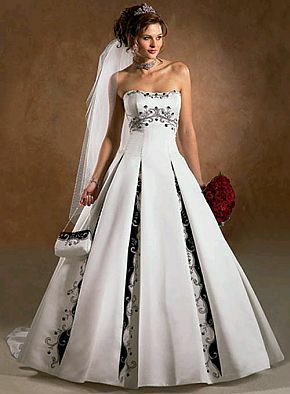 Beautiful pattern for wedding dress, the most striking detail is the black tie with a flower at the waist and skirt with vertical layers of fabric. Finally, elegance and modernity complement each other perfectly in this model of wedding dress with a bow at the waist and wide skirt, achieve an ideal contrast with the costume fitting at the top. I hope these models modern wedding dresses, have pleased you.